Correct signage can protect you from vehicles and cycles ploughing into your work site and putting you and your colleagues in danger. At the same time, signage helps to guide road users so that they do not end up injuring one another near to roadworks. Test yourself and find out whether you are ready to work safely in traffic zones. 1 metre above the roadway is high enough to allow all vigilant road users to see the road sign. It is also a good idea to have it a little higher – 1 metre is the minimum height. Roadworks Must be used for all roadworks when people moving about are working on small roads with very little traffic. Men at work Must be used when there is no time to put up traffic barriers. This sign is for your safety. It is important for you to use it every time you are working on the road so that road users can be warned to let them know you are on the road. 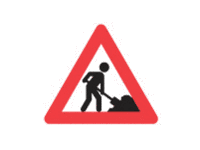 You can dispense with this defensive sign only when working on smaller roads where there is very little traffic. 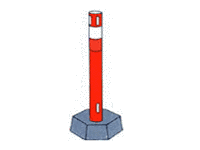 Marker cones are used to make longitudinal barriers and delimitation lines for temporary roadworks, both stationary and mobile. When roadworks are stationary and taking place in densely populated areas, there must be no more than 6 metres between every cone. Outside densely populated areas, there must be no more than 20 metres between every cone. Do you have to mark cycle paths? Yes, but only as an emergency solution. And then you also have to make sure that it poses as little risk as possible to cyclists. You can only put signs on cycle paths if no other option is possible. And if you have to place cones or barriers, for example, on a cycle path as a last resort, they must be secured such that they do not shift too easily, otherwise they will pose too much of a hazard for cyclists. For all roadworks, you have to set up barriers along and across the road around the area in which work is taking place. This is to prevent vehicles from driving into the roadworks from behind, and at the same time it prevents vehicles from driving into the area where the roadworks are taking place and where equipment is left standing. There are lots of different kinds of barrier. You have to select the type that best suits the type of roadworks that you are working on – mobile, stationary, types of machinery, etc.